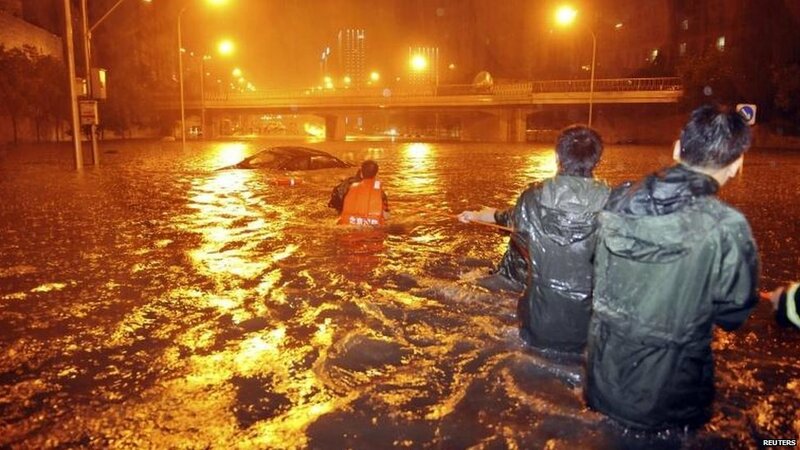 China’s capital Beijing has been hit by the heaviest rainfall in 60 years and has left 10 people dead and stranded thousands at the main airport. The deluge struck on Saturday afternoon and continued into the night, flooding major roads, state media said. Roof collapses, lightning strikes and electrocution from downed power lines were among the causes of the deaths. More than 500 flights were cancelled at the main airport, the Beijing News reported. State media said flooding and landslides also killed four people in northern Shanxi province and six in south-western Sichuan province. State news agency Xinhua said 460 mm (18.1 in) fell in the capital’s Fangshan district, with the capital as a whole averaging 170 mm. It said 14,500 people, mostly in outlying districts, had to be evacuated. “There could be further large-scale storms or extreme weather,” the Beijing city government’s website said.